Have you installed the Avatar Toolkit 2 yet? These tutorials will guide you step by step to learn all the basics and some cool applications of using the Avatar Toolkit to create your own puppet-ready characters and props. There are more tutorials to come. 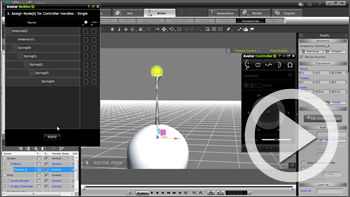 To know the overall topics of Avatar Tookit tutorials, please click here. You may also click "Online Help" for more product knowledge. The Avatar Builder is a powerful and versatile tool that allows you to add puppet-ready accessories to any part of your character to enhance it's look and provide unique motion abilities to different body parts. It can be a little intimidating to operate at first, so we're going to start learning from the bottom up. 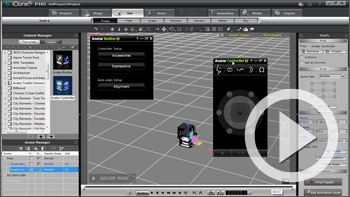 This tutorial will help you understand more about the basic functions and UI of the Avatar Builder, and its relation to the Avatar Controller. One of the more challenging parts of setting up your puppet-ready accessory is properly assigning its roots and controller handles. 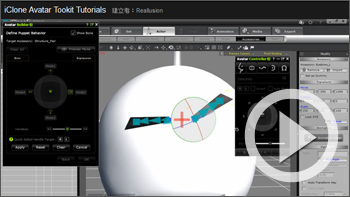 This tutorial provides a simple example of a single linear accessory being attached to a character, then having its roots and puppet behavior assigned. Keep in mind that every accessory is different, so the bone hierarchy of your accessory may not be this simplified. So now that you know how to set up a single accessory's roots and control handles, how about we double it? 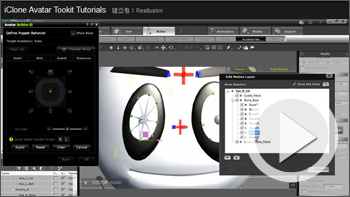 Part 3 of our Avatar Builder tutorial series will show you how you can set up your control definitions for a dual accessory such as ears, eyes, or in this case eyebrows, then animate it with the puppet controller. After you know how to create your own pair structure accesssories, the next step is to learn about how to assemble and define accessory eyes. Eyes are the most complicated part to create, but what else do you expect for the windows to the soul? This tutorial outlines the typical eye structure for most iClone eye accessories, then goes step-by-step to show you how to assemble and define your own custom eyes. One unique aspect of the Avatar Toolkit is the ability to define motion profiles for every single accessory attached to your character, then consolidate all the data into a single controller so that they can all be animated simultaneously with simple mouse movements. It's actually a lot easier than it sounds! 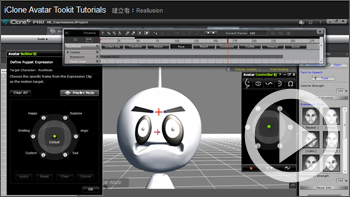 In this tutorial, you'll be given a brief example of how you can assign two completely different expressions to the Puppet Controller, modify them, and then animate them. This quick tutorial shows you a couple of different ways in which you can save auto-alignment data to your iAccessories. This allows you to apply any of your saved accessories to different characters and have them apply exactly where you want, without the need to move them around. 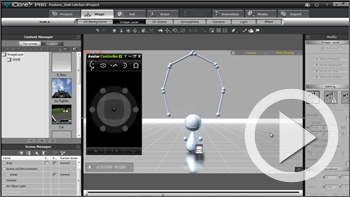 With the Avatar Builder, you can construct your own props by combining various primitive shapes or other props, and then control the structure you've created with the flexible Avatar Controller UI. In this tutorial, you'll see how to assemble a functional claw accessory from scratch and define it's controls. Then you'll duplicate it to form a sort of super claw, all parts of which can be controlled simultaneously. 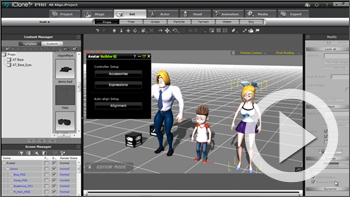 With Avatar Toolkit 2, not only can you define movement values to control your accessories, but you can also setup dynamic material changes in your accessories that can be manipulated in real-time with the Avatar Controller. 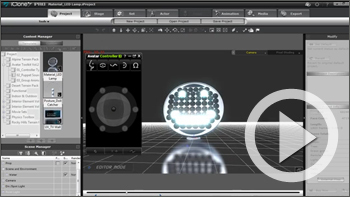 In this special project tutorial, you'll be guided through a couple of the embedded projects that are included with the Avatar Toolkit 2. After that, you'll see how to quickly apply simple material change settings to a prop to create some really cool effects.